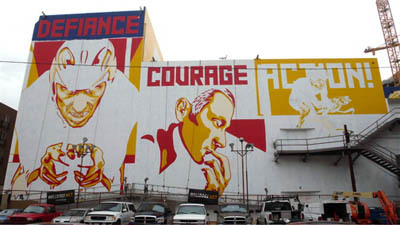 Our bros at Road Bike Action reported today that Shepard Fairey is working on a large-scale mural with a Livestrong theme. Lance’s ability to transcend cycling and tap into creative and inspiring outlets to further his message of hope to the cancer community is unparalleled. RBA plans to be at the announcement on Saturday so we will keep you posted. Also note that we’ll see some of Lance’s art at Mellow Johnnys during the Austin Rides! Fashion Show and ArtBike! is representing at the Mobile Social SXSW.